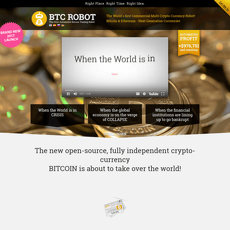 4 Cryptocurrency and Bitcoin Trading Bots - Cryptolinks - The World's Best Cryptocurrency Sites List! 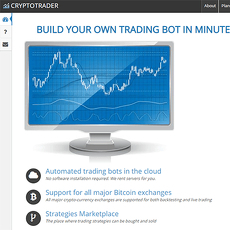 The use of Trade Bots is the newest and advanced way of trading without stress. In simple terms, it means a Robot being able to conduct all trades for you while you do other day-to-day activities. 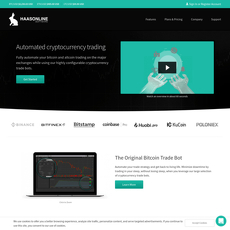 Now, this isn’t an actual robot but a designed robotic program that processes commands and delivers actions for a particular crypto trade. Crypto Trade Bots have made so many lives better because they can now focus on other daily activities rather than cryptocurrencies. You don’t have to tell the robot what to do as well, it just processes information and makes sure you buy or sell or trade conveniently. However, no matter how easy these trade bots have made lives, there is always one impact an individual has to make, and that is: devising a trade strategy. A trader’s trade strategy is what the robotic programs will respond to and use to execute trading activities. They start thinking alike with humans and make sure errors are avoided. The software listed above have different ways they operate even when they are easy and free to use. For instance, for BTC Robot, it is clear to tell that it only run operations for Bitcoin and other Bitcoin-related cryptocurrencies while Cryptotrader Bot or Gekko will go any length for several cryptocurrencies. They have been programmed with different mechanism of operation but all require human trade strategy before executing trading activities. As an individual who would love to use crypto trade bots, you must already have a mastery on how trading works. You must have had several strategies during your experience before you use them. It isn’t always a good option for beginners because it wouldn’t be easy devising a strategy that may be unhelpful. Has a Pro trader, you must have programmed different sets of strategies to the trade bot so that in case one doesn’t work out, it could try another still with the same purpose and you earn as much as you can. Trade bots are very easy to use if you have a knowledge about trading and can devise different strategies aiming at one goal. Trading involves different cryptocurrencies and coins, you need to make sure the kind of software you are downloading supports the type of coins you have in your digital wallet. Obviously, you will be connecting your digital wallet and address to the trade bot so trading could be easier, faster and convenient. In cases where an amount of coin has to go out either to sell or buy, you could device an authentication or security protocol to keep you protected and let you monitor your funds. Commands are basically what Trade Bots understand not language. As a trader, you need to be familiar with the commands either available on the helpdesk or a kind of manual that allows you execute trades easily without any barrier. Developer tools are very important features you should consider before selecting a type of crypto trade bot; it shouldn’t be too complex. The duo are the only ways you can control, monitor and understand your crypto trade bot without difficulties (it is a solution to language barriers in trading). No matter how much of a programmer or developer you are, you need a support service for your software. Every software developer has his or her own mark or signature that would only be understood when contacted for proper explanation. The best crypto trade bot software always has a customer service support that ensures solutions to problems are provided. Likewise, the way the best crypto trade bot can be selected is in the number of features it offers. Features that are different from the usual characteristics of a software are very important and it is a factor the functionality of the trade bot depends on. The 4 crypto trade bots in this category have been reviewed, the best out of them can be selected when you consider its content, pros and cons. Trade bots have been designed to make our lives easy because we can now focus on our day-to-day activities while still being actively involved with the crypto life. In conclusion, there could be other factors that would lay claims on why you can select one software over the other but for now, those provided above are the major ones you need to consider.